The CHH Mini Folding Pool Table is an all packed despite its small size. It’s not just its size that you can call perfect, it’s an all-in-one package. It comes with real billiard balls, 2 pool cues, a rack, brush and chalk. This table has foldable legs that makes it very easy to set up and keep at the same time. This foldable pool tab﻿le is one to admire. 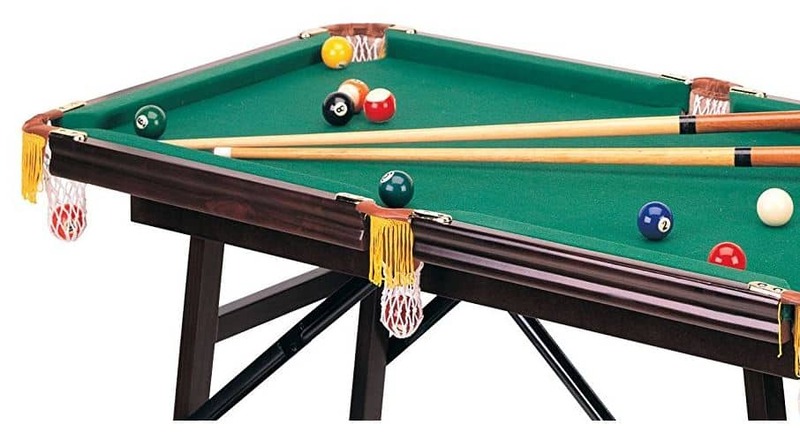 If you want all the benefits of a miniature pool table in one, then this is something you should consider to buy. For its price, you’re definitely getting the best out of every penny and more. Seen in the photo is a CHH mini billiards table looking stunning inside a customer's home. No need to worry about storage anymore as the CHH Mini Foldable Table could even fit under your bed when folded. This table is both a space saver and a life saver. 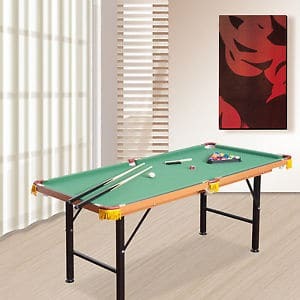 It is the ideal pool table for those who are short on space but truly wants a pool table of their own at home. For one, its legs are made of solid steel so you can be assured that it’s sturdy and made to last at the same time. Another selling point of this table is its price. Sure its cost seems to be among the average costs of mini pool tables. But this one comes with unbelievable perks such as p﻿oo﻿l balls and other billiard﻿ ﻿﻿﻿ac﻿﻿cessories. What you’d surely love about this table is having the chance to experience a game of pool at the comfort of your home. A pool table that doesn’t take up much space and you can comfortably move elsewhere if you desire. The CHH Mini Folding Pool Table has received a total of 77% 5-star reviews, 16% 4-star reviews and 7% of other review scores. Without any surprise whatsoever, its overall star rating average is 4.7 out of the possible 5 stars.